Hereditary Cataracts is an inherited eye disease in French bulldogs. Cataracts are opacities in the lens of the eye caused by structural changes in lens proteins. A normal lens allows light to pass through it to the Retina in the back of the eye. Light cannot pass through the parts of the lens affected by cataracts and vision becomes blurry. Dogs with Hereditary Cataracts most commonly present within a few weeks to months after birth with small cataracts that are visible on a veterinary eye exam. Cataracts from this disease will eventually affect the whole lens in both eyes leading to complete blindness between 2-3 years of age. Of note, not all forms of cataracts are inherited and environmental factors such as UV damage can also play a role in the severity of disease. The Mutation of the HSF4 gene associated with Hereditary Cataracts has been identified in French bulldogs, although its overall frequency in this breed is unknown. Genetic testing of the HSF4 gene in French bulldogs will reliably determine whether a dog is a genetic Carrier of Hereditary Cataracts. Hereditary Cataracts in the French bulldog is inherited in an Autosomal Recessive manner meaning that they must receive two copies of the mutated gene (one from each parent) to develop the disease. In general, carrier dogs do not have features of the disease but when bred with another carrier of the same Mutation, there is a risk of having affected pups. Each pup that is born to this pairing has a 25% chance of inheriting the disease and a 50% chance of inheriting one copy and being a carrier of the HSF4 gene mutation. Reliable genetic testing is important for determining breeding practices. Because symptoms may not appear until adulthood, genetic testing should be performed before breeding. In order to eliminate this mutation from breeding lines and to avoid the potential of producing affected pups, breeding of known carriers to each other is not recommended. French bulldogs that are not carriers of the mutation have no increased risk of having affected pups. 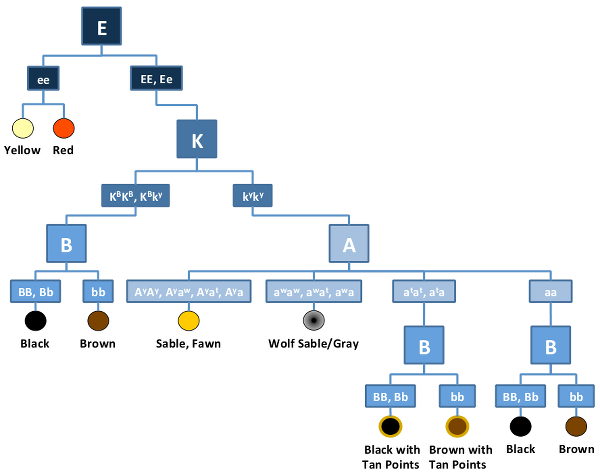 There may be other causes of this condition in dogs and a normal result does not exclude a different mutation in this gene or any other gene that may result in a similar genetic disease or trait.